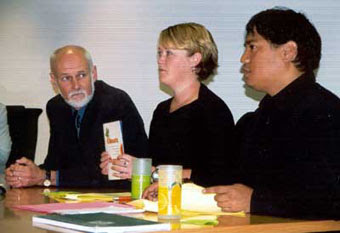 In spite of (or more likely because of) his long history of radical activism, Teanau Tuiono holds an influential position in state education. Teanau Tuiono has been active in the digital world for a number of years with an emphasis on how that world impacts on indigenous peoples, locally and globally. He has participated at the UN World Summit on the Information Society (WSIS) promoting indigenous perspectives with other indigenous peoples. Teanau Tuiono is currently the community facilitator of the Mäori education and Pasifika education communities on Te Kete Ipurangi [TKI]. TKI is a bilingual portal-plus web community which provides quality assured educational material for New Zealand teachers, school managers, and the wider education community. In other words, Teanau Tuiono is involved in providing "educational material" for hundreds of thousands of school children. This key position involves interaction with senior officials and government ministers. One of Tuiono's project has involved working on a booklet on "Climate Change"
Interestingly Teanau Tuiono is also involved in the UN sponsored International Indigenous ICT Task Force which is soon to hold a Climate Change conference. Pre-registration for the Seventh Session of the United Nations Permanent Forum on Indigenous Issues is now open. The Seventh Session will take place at United Nations Headquarters, in New York, from 21 April to 2 May 2008. The special theme will be "Climate change, bio-cultural diversity and livelihoods: the stewardship role of indigenous peoples and new challenges." I have documented Teanau Tuiono's alleged ties to the "Urewera 17" and their supporters here and here. Interestingly that Teanau Tuiono's close associate Tia Taurere and alleged Urewera co-trainee Kristin Gillies have been touring the country with Greenpeace lecturing high school pupils on the dangers of "Climate Change"
It would be interesting to know if they are using Teanau Tuiono's "Climate Change" booklet in their promotional material? "In other words, Teanau Tuiono is involved in providing "educational material" for hundreds of thousands of school children." Fortunately most of the material TKI provides is to the maoist communist run kohanga reo separatist schools. But it is still disturbing to know that our good mainstream schools are infected with fascist indoctrinators such as Tuono and the like. oh my goodness rofl. i would love to know if you've ever sat down and had a conversation with teanau. What is your biggest problem with him? That he is involved in helping indigenous people around the world? or that he is involved in helping get information to people about protecting our environment? I find much of what you have to say in your blogs more offensive and certainly more damaging than anything i have ever heard from Teanau. I think it's a joke that you think he's involved in a take over the world conspiracy when he is open to probity, love to know what people would find and make assumptions about if they dug into your life.